To expose a faction threatening America’s democracy, Emily Rose joins forces with a team investigating her sister’s murder, but she never expects to fall in love––or to encounter her twin’s ghost. Ashton Frasier accepts his detective career choice means a life of bachelorhood––until Emily Rose blows into his world. The spitting image of his latest victim holds a mysterious allure he can’t deny. 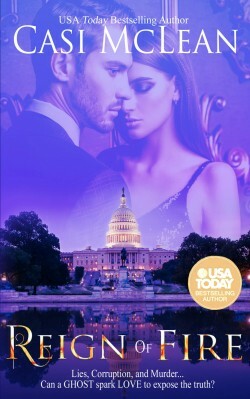 Surrounded by danger with the country’s democracy at stake, can Emily and Ash find Alyssa’s murderer and uncover a deadly shadow government threatening to take the White House? When love sparks danger…even Ash burns.